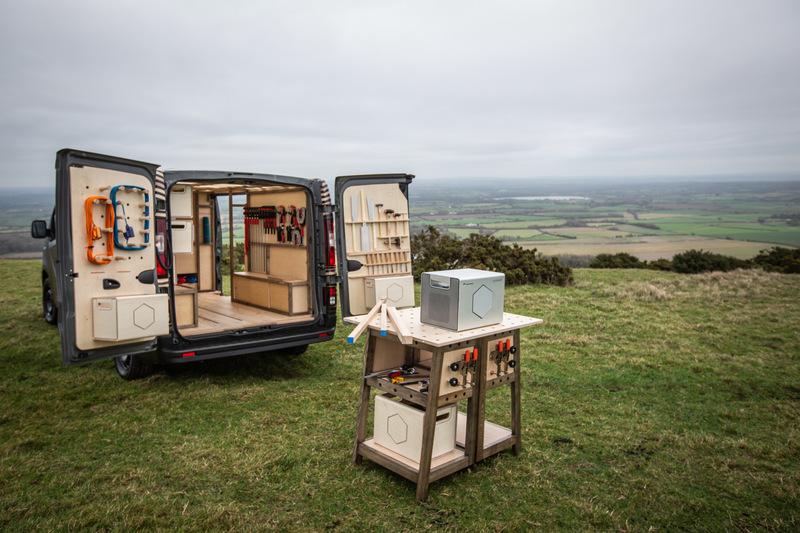 Over the years, we’ve seen thousands of unique van conversions, but Nissan has taken the van-loving world by storm with its new NV300 concept van — a mobile workshop for woodworking professionals. 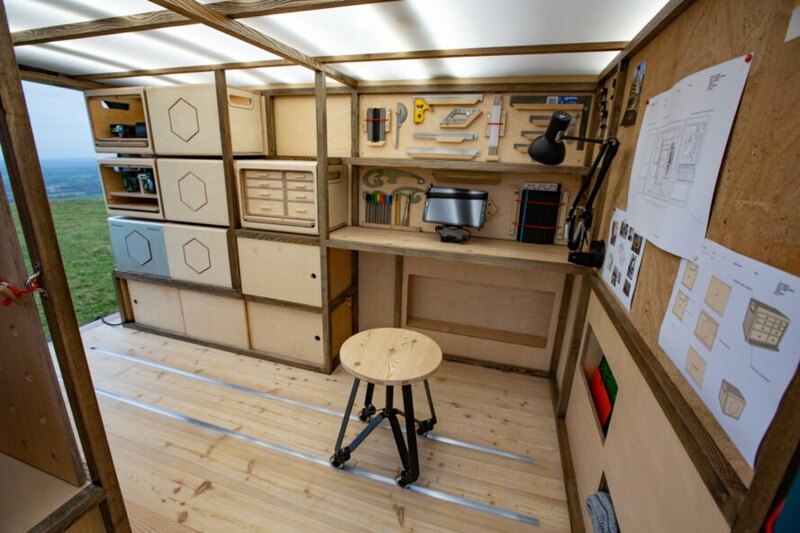 The amazing design, which was a collaboration between Nissan and UK-based firm Studio Hardie, is fully-functioning mobile woodworking studio that can be taken off grid, letting wood-loving artisans find inspiration anywhere they choose. 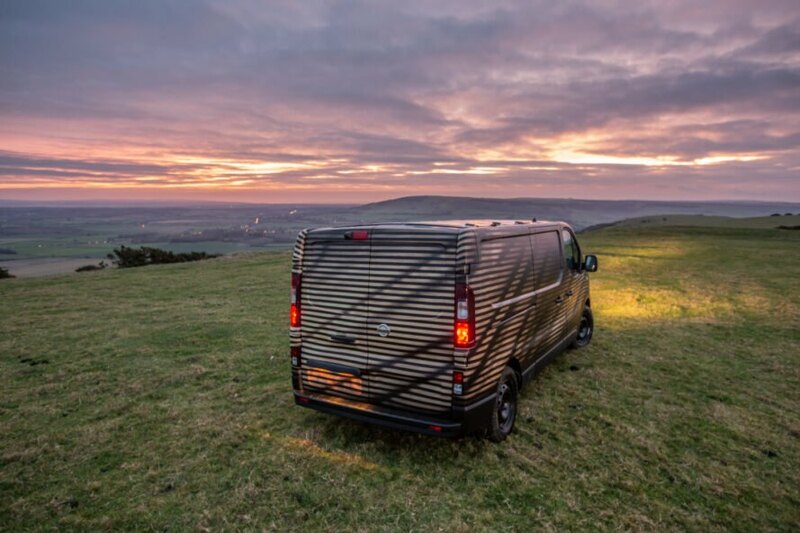 What’s more, the van runs on solar power and its tools are powered by an emissions-free, weatherproof power pack made out of recycled electric car batteries. 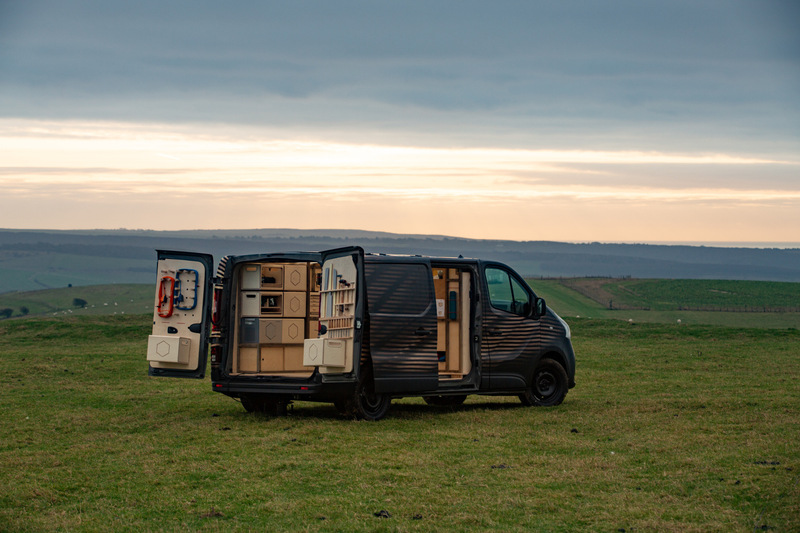 Unveiled at the Brussels Motor Show in Belgium, the van’s incredible design was created to provide the average craftsperson with optimal flexibility to move regularly between jobs as needed, in a functional and sustainable way. Slated for a springtime launch in Europe, the van will come in various lengths and heights. 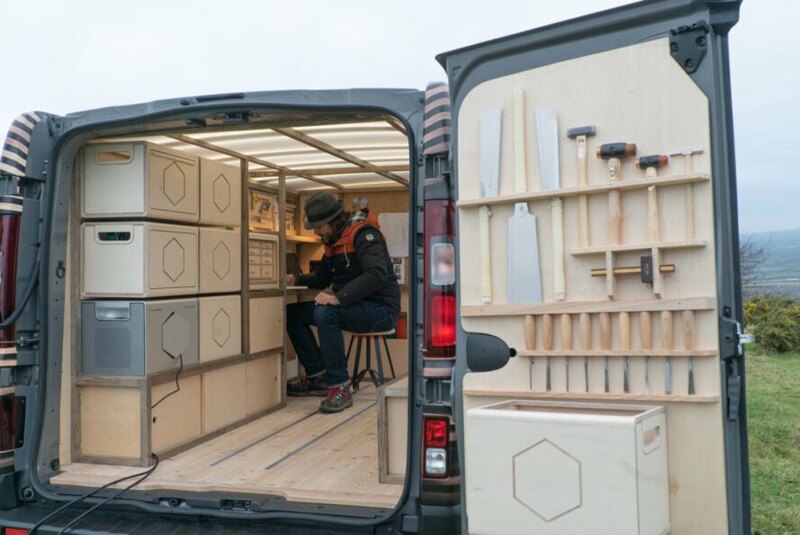 By contrast to the dark exterior, the van’s bright interior space lit by LED lighting is a woodworker’s dream come true. Lined in “lightweight and strong” pale ash, peg boards, boxes, cabinets and cubbies were built into the walls, while the doors have been outfitted for optimal tool storage. A wheeled stool glides on on metal rails to keep it from sliding around. The open interior allows the woodworkers to use the portable workbench inside during inclement weather. 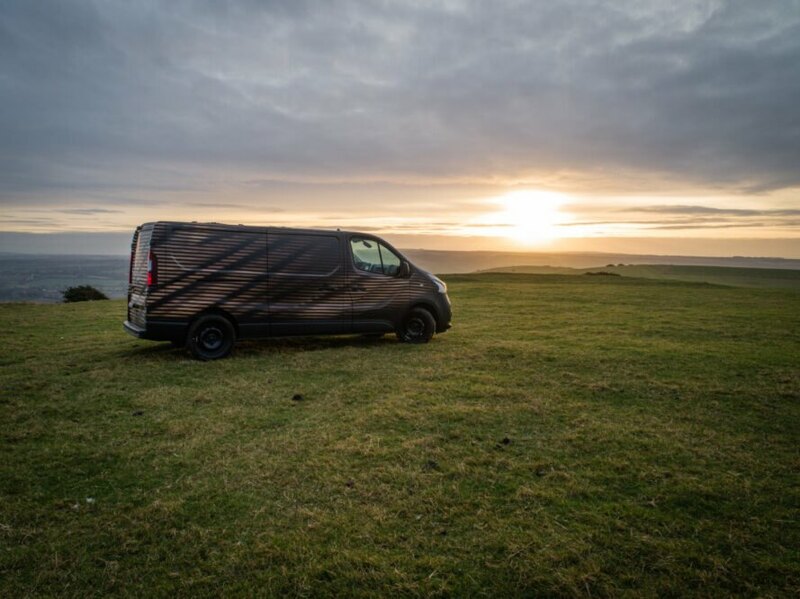 As an energy source, the van conversion operates on solar power and can go completely off grid. All of the power tools run on an Energy Roam battery, an emissions-free, weatherproof power pack with a storage capacity of 700 watt-hours. The batteries are repurposed from Nissan’s Leaf electric vehicles. Nissan recently unveiled its NV300 concept van at the Brussels Motor Show. The design team from Studio Hardy worked on the interior. 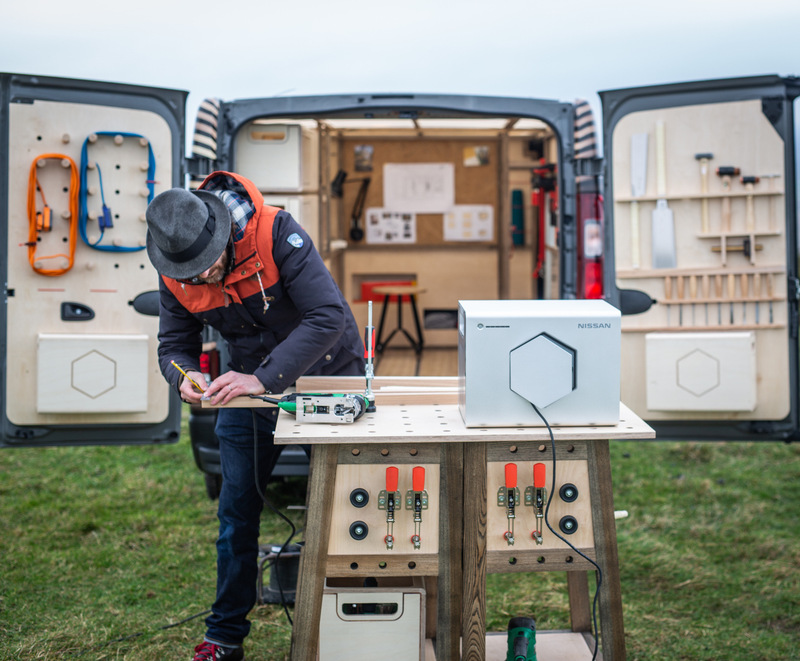 The van is a custom-made mobile woodworking studio. The interior of the van is outfitted with everything needed to take the shop on the road. The walls are lined with shelving and all kinds of storage. 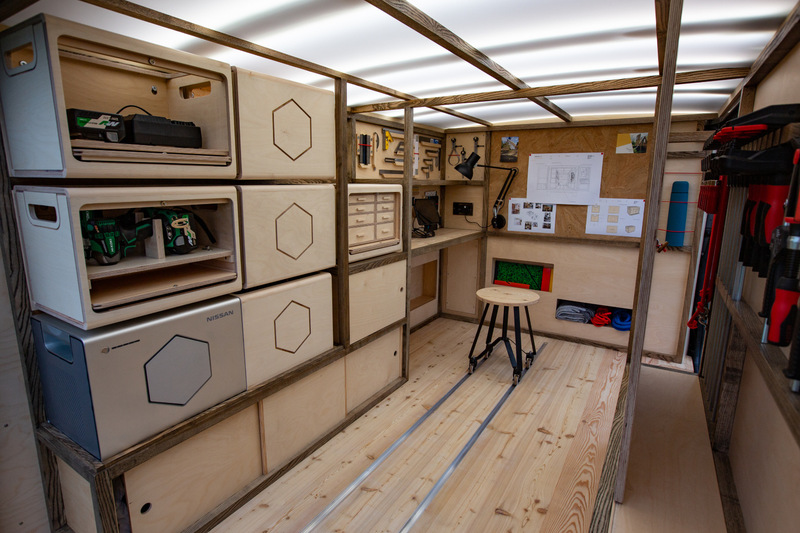 A mobile work bench lets workers do their jobs inside or outside. The tools are powered by second-life batteries recovered from Nissan LEAF electric vehicles. The inside of the doors have been outfitted with tool storage. Slated for launch in spring of 2019, the van will come in various lengths and heights. 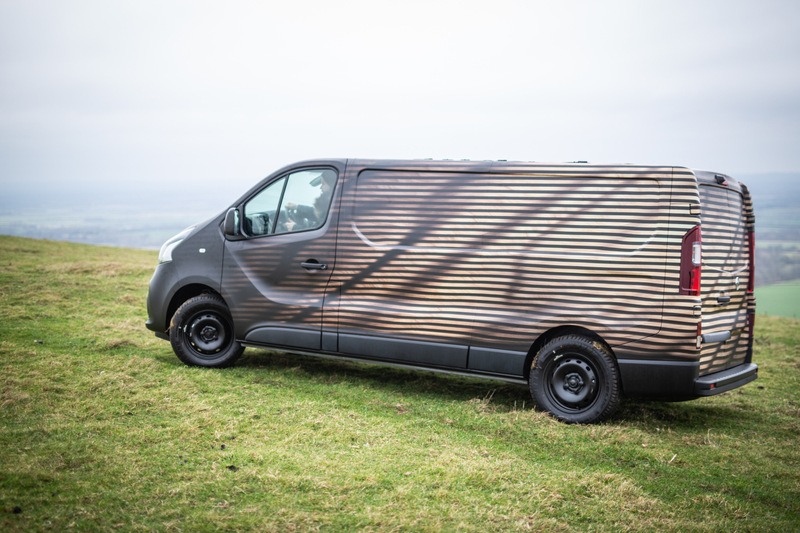 The van has been designed to give woodworkers the option to work on the go, sustainably.